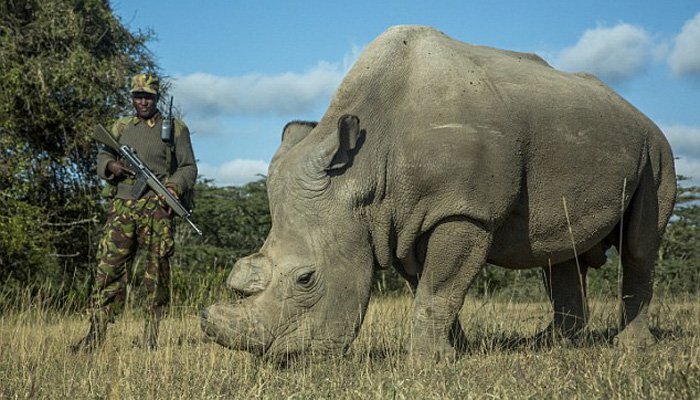 NAIROBI: The last male northern white rhino has died in Kenya at the age of 45, his keepers announced Tuesday, leaving only two females of his subspecies alive. The rhino, named Sudan, “was being treated for age-related complications that led to degenerative changes in muscles and bones combined with extensive skin wounds,” according to a statement from the Ol Pejeta Conservancy where he lived under armed guard to prevent poaching. Theoretically, the death of Sudan assures the extinction of this subspecies of rhino. However, scientists have gathered his genetic material and are working on developing in-vitro fertilisation (IVF) techniques to preserve the subspecies. The northern white rhino population in Uganda, Central African Republic, Sudan and Chad was largely wiped out during the poaching crisis of the 1970s and 80s, fueled by demand for rhino horn in traditional Chinese medicine in Asia and dagger handles in Yemen. A final remaining wild population of about 20-30 rhinos in the Democratic Republic of Congo was killed in fighting in the late nineties and early 2000s, and by 2008 the northern white rhino was considered extinct in the wild. Four fertile rhinos, two males and females, were moved from the Dvur Kralove Zoo in the Czech Republic to Ol Pejeta in Kenya, with high hopes that conditions similar to their native habitat would encourage breeding. Further efforts to mate a male southern white rhino with the females, and thus conserve some of the northern white genes, were also unsuccessful. “Sudan was the last northern white rhino that was born in the wild. His death is a cruel symbol of human disregard for nature and it saddened everyone who knew him,” said Jan Stejskal, Director of International Projects at the Dvur Kralove Zoo.